(b) the date on which relevant approved handler test certificate expires. It is replaced effective from 1 December 2017 by a two pieces of legislation. (b) a substance listed in Table 3 in Schedule 9. (2) A contractor must not handle or apply the substance unless the contractor is a qualified UPM contractor. substance is being applied by the contractor. (b) has been credited with all of the units or unit standards specified in row C or D.
How long can our current pest controllers who hold approved handlers continue to do Pest Control without completing the training outlined in table 3 - Schedule 9 (A or B or all units of either C or D). Example 1: A pest controller whose approved handler expires at the end February 2019, can continue to do Pest Control without doing the training in Table 3 of Schedule 9 until 31st Dec 2019, and without extending or re-applying for their approved handler, as 31 December 2019, is the later of the applicable dates. Example 2: A pest controller who's approved handler that expires in January 2021 can continue to do Pest Control without doing the training in Table 3 of Schedule 9 until the end of January 2021, as this is the later of the applicable dates. Do all Pest controllers need to do the further training outline in Table 3 - Schedule 9 or only some of them? The notice states “a pest controller must not handle or apply the substance unless the contractor is a qualified UPM contractor. (b) is available at all times to provide assistance, if necessary, to the contractor while the substance is being applied by the contractor. AND then remains available at all times to provide assistance (if necessary) during the time the substance is being applied at that site by the non-qualified UPM contractor. This could mean; either the qualified UPM contractor remains onsite to supervise OR can leave the site, but only if they remain contactable by phone at all times if they need to be contacted. Therefore, at the very minimum a pest control business need only have one Qualified UPM contractor, they alone can handle or apply UPM substances themselves. Does the qualified UPM contractor (if only putting 1 person through the official training in Table 3 of Schedule 9), have to also be the owner of the business and/or the PCBU, or can they just be an employee? New Staff (after Dec 2017, who do not already have any form of approved handler): Do I need to have them attain a certified handler test certificate first, and before they are able to apply UPM substances (under the supervision of a qualified UPM contractor as per the answer outlined in my question 2 above?) OR as long as the answer in my question 2 is followed the new hire doesn't require other certification of any kind? From 1 June 2018, the new regulation came into force that means you must now keep a record of all of the information, training and instruction you give your workers about hazardous substances. Are non-qualified UPM contractors able to just continue to do baiting (either rodent baiting and/or Ant or cockroach gel baiting) only, and without having to complete the further training in table 3 of schedule 9 or be supervised by a qualified UPM contractor? . . . or what is the determining factors there, and if the answer is yes, would they need a certified handler certificate? Please refer to the answer in four above. That applies to all hazardous substances including rodenticides and Ant and Cockroach Gels and Baits. So, whilst no certified handler certificate or qualification is required to use the substances referred to, training must still be carried out and documented as required by the Act. What is required for a pest control contractor to become a member of PMANZ? 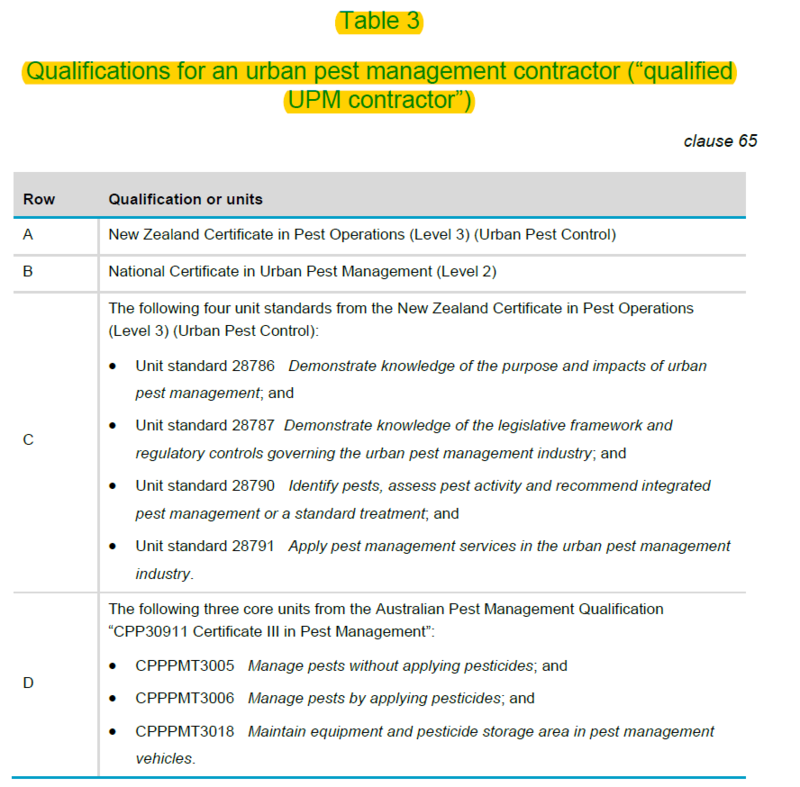 A Master Registered Technician of PMANZ has attained the National Certificate in Urban Pest Management (Level 2) (or equivalent) or New Zealand Certificate in Pest Operations (Level 3) (Urban Pest Control), hold current Public Liability Insurance, and a Health & Safety Policy in place. Training Members are not entitled to vote at meetings or use our logo in their advertising, but will be able to identify themselves with current photo ID badge, which will show our logo and the expiry date of their registration as a Trainee Technician. What is required for a company to become a member of PMANZ? How much does it cost to become a member of PMANZ (both for just 1 person and also cost for a company to become a member of PMANZ)? What does being a member of PMANZ offer/open up to us? The Association was formed in 1976 to raise the standards within the industry and to protect its members' interests. It is recognised as the voice of the industry. We work with many governmental agencies to promote and ensure that the needs of our members and community are always put first. By employing a PMANZ Master or Registered Technician, members of the public are assured of a qualified professional service which has met our strict membership criteria. They don’t need to ask you the questions as membership provide them with surety of your high standards, therefore passing the first hurdle for obtaining clients. PMANZ also hold regular training roadshows that are not aligned to any organisation and are designed to educate and promote best practice in our industry. These are run by pest managers for pest managers. There is a biennial conference which PMANZ executive work to reduce the cost via sponsorship. Speakers at the conferences are well known experts in their field.